We were impressed with the first batch of Cooltrons, and this pedal is a worthy addition to the range. Powerful EQ circuitry makes for great tonal flexibility. Not an overwhelming amount of bottom end. What makes the Cooltron pedals unusual is that they have valves but can be powered by standard AA batteries. The valves in this pedal are designed to run at very low voltages (a method known as 'starvation', also used by Edward Van Halen on his old Variac-modded Marshalls) but without the usual problems of biasing and, er, valve death! The new addition to the Cooltron family features the same rugged design, with tough steel casings, retro chickenhead knobs and a mirror finish. The pedal can be powered with either four AA batteries (supplied) or a 9V DC adaptor (not supplied). 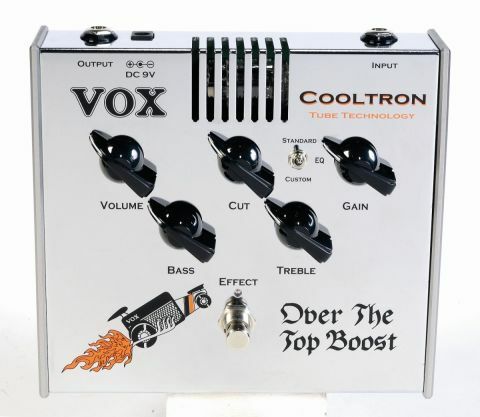 Billed as being able to "blast your tone over the edge and back", the OTTB is based on the Top Boost channel of the Vox AC30. The control layout is exactly the same as on the Snake Charmer, with five knobs and a single mini toggle switch. Volume, gain, bass and treble are self-explanatory and provide the same sort of flexibility you'd expect from a decent overdrive pedal. The cut control works exactly the same as the cut control on a real AC30TB, reducing high-frequency content as you turn it clockwise. This control is placed later in the signal chain than the other EQ controls, so it can be used as the final stage of sound-shaping, controlling any excessive high frequencies resulting from high gain settings. The mini toggle switch affects the way in which the EQ controls work. In standard mode, the bass and treble controls are interactive; for example, tweaking the treble will also have an effect on the lower frequency characteristics and vice versa. Switching to custom mode makes the EQ controls work with more independence. Now, a pedal with a single valve is never going to match an amp with 10 assorted valves, but that's not really the point. The sound of the OTTB is always going to be affected by the amp you plug it into. That said, we coaxed a wide range of convincingly Vox-like sounds from this pedal, ranging from twangy early George Harrison riffs to fat, mid-rangey Brian May sustain. The combined EQ switch and knobs are particularly powerful and can play an important part in shaping the overdrive characteristics. Our favourite sound involved driving both bass and treble controls hard (around 80 per cent) in standard mode and turning the cut control to about 60 per cent to counteract the hardness. Meaty rock solo heaven! Our only criticism? While there's plenty of treble and upper mid-range bite available, the OTTB is a little thin on bass response. Even with the bass control turned up full, we could envisage situations where we'd need more bottom end.